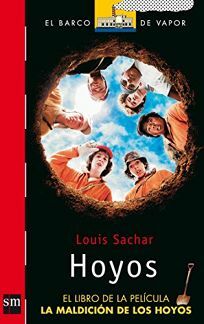 Gr 5-9-First published in English in 1998 by Farrar, Straus & Giroux, Sachar's novel about delinquent boys at a bizarre prison camp has been translated into at least 16 languages and has received several major awards including the Newbery. The adolescent Stanley Yelnats is sent to a work camp in Texas after being falsely accused of a minor crime. The sole occupation of the inmates is to dig deep holes in the hard floor of a dried-up lakebed where Campamento Lago Verde (Camp Green Lake) is now situated. The Yelnats family history dates back to an ancestor who had once lived in the same area where the prison camp is now operated. This historical narrative is revealed in occasional chapters interspersed throughout the novel. As Stanley learns to survive in this harsh prison, he begins to realize that his fate is irrevocably tied to the past. The two plots intertwine as Stanley takes control of his own fate and in the process reverses the family curse. There are many YA themes in this well-crafted story: teenage alienation, bullying behavior, tough kids who turn out to be needy, arbitrary authority figures who wield their power despotically, coming of age, and more. Abos has provided an above- average translation with only a few rough spots. Recommended for bookstores and libraries. Maria Otero Boisvert, ""Criticas""